I use the air quotes because it barely feels like spring. My current coat, a Calvin Klein cashmere-blend dress coat is fairly heavy, but even with that and a scarf, I feel cold more often than not these days. (As an aside, though I doubt anyone is in the market for a wool coat at this point in the year, but the coat on me is less boxy and, in my opinion, better-looking than it is on the model. It is tapered at the natural waist on me.) It's too warm for the "Zara" style blanket scarves I was wearing most of the winter, and I have put my down coat away, but otherwise, my outfits have not changed extremely much since winter. 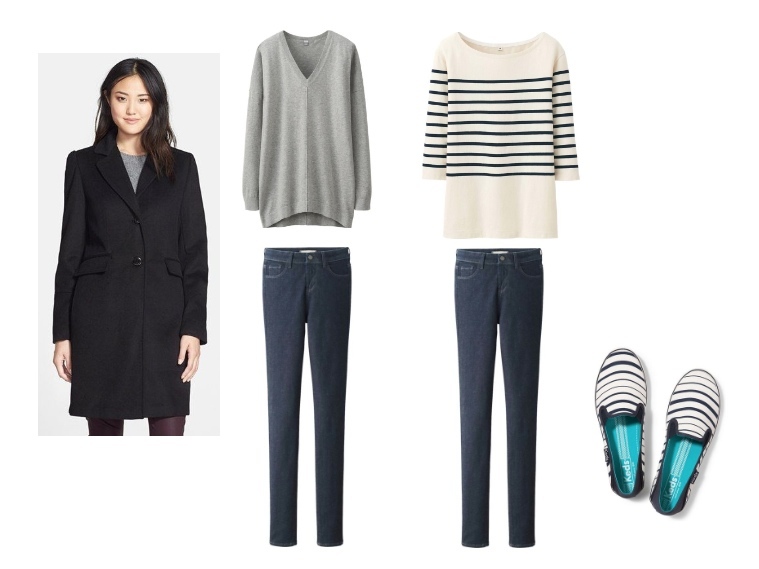 I've been getting a lot of wear out of some of my February and March purchases, namely the Uniqlo sweater, the Uniqlo striped tunic (February), and the Keds slip-ons (March). I have plenty of other clothes, but very few sweaters and other non-winter tops with the slouchier, more casual silhouette that I've been favoring in recent months, which means that I've been defaulting to these two tops fairly often. I love the slip-ons so far, they're quite comfortable. What are your favorite items so far this season? It doesn't feel like Spring here in Chicago this week either, but I refuse to wear my wool or down coat any longer, and have relegated myself to a fleece underneath my short trench coat. I've been relying on my two grey/white striped tops recently. One from Gap and the other from Everlane - usually with blue jeans. Either that, or my chambray shirt, which is warm enough for chilly mornings, and if it gets warmer, I just roll the sleeves up. Striped tops are great, as are chambray shirts! It is finally starting to warm up here in NYC, so we might actually finally be at the point in the year where I can put my wool coat in storage.